Household technologies, such as portable CD-players and cassette recorders, aren’t exactly state-of-the-art tools for electroacoustic music, but allow for ways of composing and performing music that are not readily available by more sophisticated means. 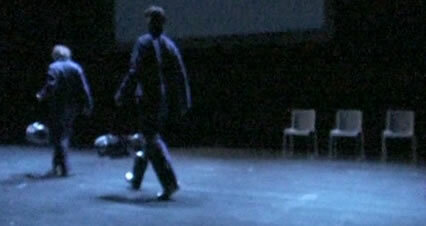 This is exemplified by two electroacoustic compositions made with cassette recorders, as well as a dance performance involving ghetto blasters. While this is not an argument in favour of Lo-Fi for its own sake, it can provide a valuable complement to more sophisticated technology. A certain manner of operating the cassette recorder leads to surreal collages, reminiscent of exquisite corpses. Portable CD-players on stage function both as scenography and as movable speakers, making true spatialisation possible. It’s a popular strategy to announce one’s work as creative abuse of technology. Chances are it makes you appear as a maverick who refuses to be the victim of ready-made software and hardware solutions. But it’s questionable whether there is any abuse at all in these uses of objects. Anyone versed in the ecological theory of perception (Gibson 1977) would prefer to talk about the affordances of various objects; some of them afford sound-making, others do not. Is “breaking the rules” an integral aspect of creativity? The whole concept of creativity is elusive, which may be precisely because of the tendency of creative behaviour to resist pre-established definition; to skip over the fences that frames your mind. If rule-breaking underpins creativity, then we must be happy with all those unspoken Thou-Shalt-Nots — the more of them, the better. Electroacoustic music as a whole is, as I see it, quite unlimited in regard to what types of sounds it might contain, and how those sounds may be organised in succession and simultaneity. This statement may appear trivial, unless one considers some of the often unarticulated expectations that accompany electroacoustic pieces. The expectations that follow electroacoustic music exist in relation to specific contexts, such as modes of presentation (in concert, on radio, CD, installations, etc. ), and stylistic norms of certain schools. The strictness with which these norms are defended may be a result of the fact that electroacoustic music is mostly an oral/aural culture. One of the strongest taboos in some circles appears to be that of (lack of) sound quality and utilisation of spectral registers. Also, one shouldn’t expect to make a good impression by presenting a mono recording on a single speaker when there is a whole loudspeaker orchestra at one’s disposal. Such unwritten rules might as well be written down for the record. Studying each and every conceivable technique (synthesis models, effects processing, getting acquainted with various software, making one or several programming languages your native tongue), is certainly a solid ground for compositional handicraft, although it needs to be complemented with training of listening skills and a broad knowledge of other musics. Besides, having all that knowledge may turn out to be a burden; it gives you too many alternatives to choose from and so many things to explore. In this sense, creativity is not about breaking rules, but can be used to put yourself in a position where you can pick and choose from a vast range of alternatives. Then the difficult part is to make those hard choices, to weed out irrelevant possibilities, including forgetting about everything you have ever learnt. No wonder then, that many productive musicians have rid themselves of advanced software, and never bothered with programming. I suspect there is a widespread myth about how composers go about their business. This popular myth has it that we start from a vision of the finished work, which is gradually materialised by all available means — and if the necessary means are unavailable, they are invented and built. This belief, inasmuch as anyone holds it, seems to underlie much talk of the composer’s intention. Apart from those few gifted people who hear what they want to compose, and then write it down (this line of reasoning is clearly most appropriate for instrumental composition), probably most of us take a winding, exploratory path which is very much guided by the circumstances and the tools that happen to be at hand. This is by no means a defeat. Letting the compositional process be shaped by unsuspected discoveries opens up for a more idiomatic expression. In the rest of this essay, I shall describe some of my compositions with obsolete techniques. This is not meant as a critique against any other form of music, such as the highly polished, glossy sound of much recent acousmatic music, which I do my best to enjoy. I grew up in the age of cassette recorders, and started experimenting with that particular tape medium early on. One technique that I discovered was to record very short fragments of any sound — often my own voice — by hitting the pause button regularly whilst making various sounds. Although cutting and splicing of audio cassette tape is possible, it is hardly recommendable. This technique of recording minuscule sound snippets (“fragment recording”) made it possible to produce fascinating and surprising sound collages. Obviously, there are severe limitations with this technique. First of all, one is restricted to posit sound events in a linear succession. To obtain specific results, a score or recording plan would need to be prepared and followed, much like a storyboard, which is invaluable in the production of an animation. Second, fragment recording is inherently limited to one sound layer, even if this may be in stereo or dual mono. In addition, cassettes of course were far from state-of-the-art in terms of sound quality already when they were introduced. Now, the sceptic will ask: what’s so unique about the fragment recording technique? Couldn’t it be done a lot easier, with more flexibility and much better sound quality in digital recording? Perhaps it can. But let’s mention a few specific features of the analogue tape recorder that could, at least in principle, be modelled by digital techniques. Analogue tape saturates at high gain settings. This is well-known and commonly used as a sound effect, of which digital emulations exist. An idiosyncrasy of the fragment recording technique is that the tape is typically started and stopped in the middle of the sound that is to be recorded. This causes a characteristic glissando effect as a start and end transient for each fragment. Assuming the sound to be recorded has a steady pitch, the tape speed will increase from zero to the regular speed when starting the recording, which will produce a short glissando from a high pitch, down toward actual pitch when played back. Similarly, the endings of fragments will have a short rising glissando. So much for the sonic artifacts. But the most important aspect is the immediacy of a tape recorder; I know of no digital audio editing program that allows for nearly as fast and convenient operation without ever crashing. Figure 1. How time passes and recorders melt. Scanner abuse © Risto Holopainen (2002). In the summer of 1998, I recorded a short piece in this fragment-recording idiom, called Bricolage Analogique. 1[1. Available on Risto Holopainen: Garbage Collection. Mere Records, 2008. [MERE001].] Perhaps my reading of On Sonic Art (Wishart 1996) that summer pushed my imagination in certain directions, but for the most part, this piece harks back to my childhood tape studies. Various available sound sources were used, such as acoustic guitar, Hawaii guitar, a Swedish nyckelharpa, a recorder or two (the wind instrument), a drum machine and maracas, but most of all my own voice. At that time I didn’t think of it as a serious composition, of the sort that might end up being played in concerts. Hence, the piece was not planned in advance, but strung together haphazardly like a surrealist exquisite corpse. Fragment recording lends itself to collaborative work, where one contributor isn’t allowed to hear the previous recorded fragments, except for, perhaps, the last one — but although this might be an interesting collaboration, it would be tremendously time consuming. In contrast, recording all material in one session, one has a certain overview and memory of what just went into the tape, and can shape the form according to some strategy. But conversely, the charm of the piece (for those listeners who aren’t offended) is certainly due to its illogical chains of sound; the only way to make it appear coherent is to listen repeatedly to it. Later on, Bricolage Analogique was transferred to a computer and slightly edited, including noise removal, mixing of different layers and some use of ring modulation, pitch shift, frequency shift, and granulation. A lo-fi purist (if such a person exists) would perhaps insist that the idea of a piece such as this is intimately connected with the medium. If so, digitizing and cleaning the analogue recording would almost be sacrilegious, at least it would not serve to communicate the idea. But I find such concept-work meagre if there is no more to it than a demonstration of a medium. Audio 1 (05:54). Original version of Bricolage Analogique, recorded on 9 August 1998 in one session. No digital editing has been made on this version, apart from noise removal. Using a tape recorder to record fragments is a simple and direct process. Anyone can do it, and the results are often amusing, while the efforts put into it are modest. There is another piece in the recorded fragment genre, that I would like to discuss: The Pitch Shifter’s Nightmare for saxophone quartet and live electronics (yes, that’s the full title, but the listener searches in vain for any saxophones, not to mention live electronics). In fact, this piece is a part of a radiophonic play, called Under Hörtröskeln (Under the Threshold of Hearing). It all begins as a radio show about contemporary music. An uninvited composer turns up and claims to have composed that piece for saxophones and live electronics, in which high voltage is used to shrink the musicians so that they fit into a matchbox, which will fly them to China. So much for the context. The Pitch Shifter’s Nightmare consists almost entirely of vocal sounds, recorded with a very lo-fi portable cassette recorder. 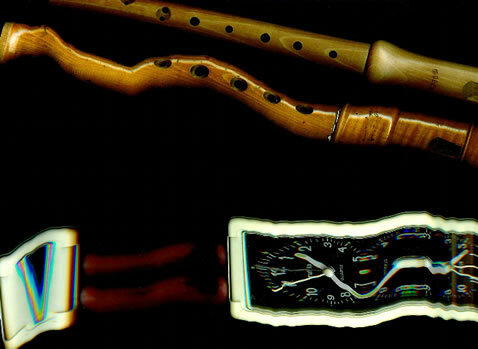 This particular recorder has a pause button with a somewhat slow response, so when you sing into it while rapidly flicking it on and off, a constantly sliding pitch results. Also, this recorder introduces lots of noise and distortion, such as high frequency content around 5.8 kHz. Some of this noise can be successfully removed, and the disturbing high frequencies can sometimes be filtered out, so that the end result is gritty but bearable. The sound quality isn’t worse than some tape music from the 1950s. In The Pitch Shifter’s Nightmare, several tracks were layered and mixed in a 5.1 surround format, to create a dense texture of vocal sounds with constantly undulating pitch, and often organically changing timbre too. Other lo-fi recordings are frequently used in Under Hörtröskeln, but most of the material was recorded with current high quality studio standards. Far from being a structurally bearing element, this contrasting of sound qualities does put things in perspective. And when there happens to be a fantastic recording available on a lo-fi medium, I see no reason to discard it just because of its poor sound quality. Such recordings cannot be arbitrarily repeated. Spatialisation is dear to much of electroacoustic music. In my opinion, one of the greatest benefits of distributing sound to several channels is that it makes it easier to open up an otherwise dense mix. It seems as if dissonance could be diminished if different layers of the mix are spatially distributed rather than coming from the same loudspeaker. Although it is possible to achieve illusions of sound sources moving in the room by various spatialisation techniques, the more direct approach of moving the actual sound source — the loudspeaker itself — seems to be an underestimated alternative. Of course typical loudspeakers used in concerts are not very inviting to being carried around. In my piece Ghetto Blaster Quintet (2009), the spatialisation problem is solved by using five ghetto blasters with as many CDs. Since there are five stereo channels, it’s actually a ten channel piece, but in practice any spatial stereo effect from a single ghetto blaster is lost at some distance. Hence it’s more appropriate to think of it as a five-part piece of electroacoustic chamber music. To those who design new digital music instruments, I would advice against using battery-driven interfaces. A dynamo would often be a much more practical solution. A direct correspondence between the physical effort put into playing and the resulting sound’s loudness is present in most acoustic instruments — and when absent from digital interfaces, there’s something amiss. Think of the Intonarumori with its crank on a wooden box; it’s the perfect instrument to put a dynamo inside. A digital Intonarumori has already been constructed (Serafin et al 2006). This could be a simple way to restore the immediacy of the coupling from mechanical energy input to acoustic energy output. In its so far first and only performance, five performers, including musicians, a dancer and the composer, enter the scene with one ghetto blaster each. These are posed on a diagonal line, and started by manual synchronisation. The music was composed so as to allow for some discrepancy of the starting times. But there are different form sections and coordinated processes going on, so these need to be well aligned. In some parts there’s even a steady pulse — the same tempo but different rhythmic patterns in each channel — so any deviations of starting times produce a unique global rhythmic pattern due to the random phase offsets. When practising the start, it became obvious that the human factor was not to blame. However, one of the CD players seemed to be slightly damaged, and would start a moment after the others. Using different brands is not recommendable, since various makes of CD players may take different amounts of time before they start playing. Another problem is to find a CD player that is loud enough to carry through a large auditorium. Since the ghetto blasters are carried around, they must operate on batteries. We ended up using one model that took ten large batteries, and after about two rehearsals of the twenty minute piece, the batteries were used up. Ghetto Blaster Quintet as we staged it was choreographed by Vivild Bergersen, with whom I have collaborated over a number of years. As it turned out, we ended up having the ghetto blasters placed on specific locations on the stage floor most of the time, and occasionally moved to another spot. Much of the time the choreography didn’t involve any active spatialisation. But at one point near the end, each of the performers in turn took a ghetto blaster, lifted it in its shoulder strap and swung it around in a circle. Because of their heavy weight they cannot be moved very swiftly. Despite this, Doppler effects were heard, so it could be compared to a manual Leslie cabinet. Video 1 (02:43). Excerpts from Ghetto Blaster Quintet, performed 21 August 2009 at the Opera in Oslo as part of the Happy Nordic Music Days. Performers: Pia Holden, Risto Holopainen, Simen Haugberg, Ellen Ugelvik and Ruth Solveig Steinsland. Choreography and camera: Vivild Bergersen. A work such as the Ghetto Blaster Quintet is to some extent the result of several compromises. Battery operation is awkward, though indispensable for mobile usage. The sound quality is far from excellent, and getting loud enough sound consumes more electricity and distorts the sound. On the other hand, it was precisely the physical presence of the sound emitter that I appreciated. The sound was calculated to be slightly distorted as it was composed — but not too much — a very harsh sound could easily be obtained by cranking up the volume to max, and this was not what I was after. The mix was deliberately raw, consisting of samples of violin crush tones, clusters of sines, and other material, all of it left in a crude state that would require further refinement if intended for hi-fi equipment. The works in my personal electroacoustic canon are often ridiculous or faulty in one way or another. Alas, music that adheres to the “æsthetics of failure” (Cascone 2000) too often fails in this respect — it’s often deadly serious. But that’s really another discussion. Interesting music may in fact be made with advanced and well-functioning technology too, but I won’t explain how here. Cascone, Kim. “The Aesthetics of Failure: ‘Post-Digital’ Tendencies in Contemporary Computer Music.” Computer Music Journal 24/4 (Winter 2000), pp. 12–18. Gibson, James J. “The Theory of Affordances.” Perceiving, Acting, and Knowing. Toward an Ecological Psychology. Edited by Robert Shaw and John Bransford. Hillsdale, New Jersey: Lawrence Earlbaum Associates, 1977. Serafin, Stefania, Amalia De Goetzen, Niels Böttcher and Steven Gelineck. “Synthesis and control of everyday sounds reconstructing Russolo’s Intonarumori.” Proceedings of the International Conference on New Instruments for Musical Expression (NIME) 2006 (Paris: IRCAM—Centre Pompidou, 4–8 June 2006). Wishart, Trevor. On Sonic Art. Amsterdam: Hardwood Academic Publishers, Simmon Emmerson (ed. ), 1996. Risto Holopainen is a Swedish composer of instrumental and electroacoustic music, living in Norway. Since studying composition at the Norwegian Academy of Music, he has made several computer animations, radiophonic plays, and composed for dance, and also participated as a performer in those events choreographed by Vivild Bergersen. In 2008 his first CD Garbage Collection was released on MERE Records. Currently he is a PhD research fellow at the Department of Musicology at the University of Oslo, with a project about adaptive synthesis with composed instruments. eContact! 12.3 — Instrument—Interface (June 2010). Montréal: Communauté électroacoustique canadienne / Canadian Electroacoustic Community.